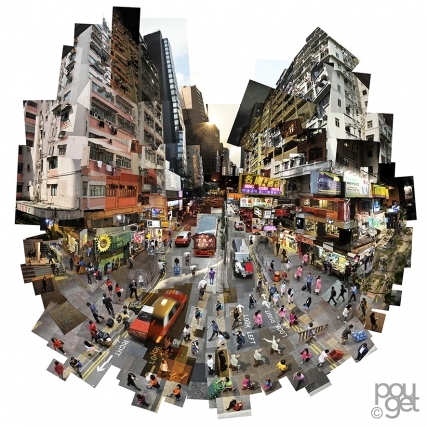 Born in Saint-Étienne, Christophe Pouget is a French artist, who currently lives and works in Lyon, France, where he has his own studio of graphic design, “Mine de Rien”, since 1995. He had previously worked in Paris for the famous marketing communications agency EURO RSCG, with customers like Dior, Vuitton and Nokia. He was a winner of “Vision of the World” – an international contest organized last year by Emmanuel Fremin Gallery, which now presents his first solo show in New York. 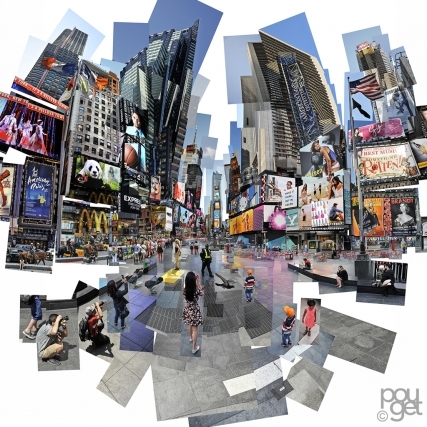 Christophe Pouget started his artistic career in 2008, when he created his first photographic assemblages. Focused on the affective relationship of time and space, his latest works are inspired by familiar cities in France or foreign places encountered during travels around the world. Yet, rather than a “visual diary”, they represent a personal evocation of emotional feelings that connect him to a specific place at a given moment and thereafter throughout the artistic process, when images are filtered through the sieve of memory. 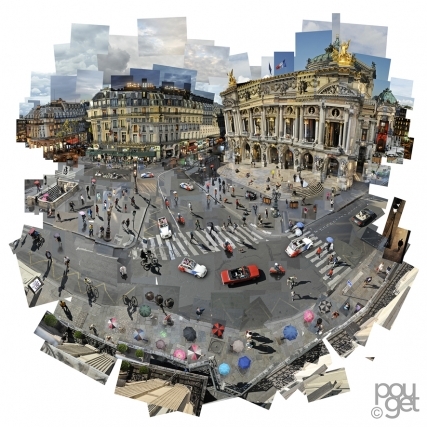 In this regard, Pouget’s art could be related to the recent scientific discovery of the brain’s “geo-tagging system”, consisting in special cells which associate places and events and generate mental maps. The artist is guided by his own philosophical belief. According to him, “we can follow many paths in life, but we all leave traces of our passage somewhere; in places where someone else was before us and did the same thing”. The network of these invisible traces embodies what he calls the “soul of places”, which he tries to capture with his digital camera. For this purpose, he takes hundreds of photographs in the same place at different moments, exploring subtle changes of light and atmosphere, just as an Impressionist painter would. Then, like in a Cubist collage, he reconstructs a unique dynamic image, with vivid colors and varied perspectives, by juxtaposing and superimposing all these pictures, of which the peripheral ones create a kind of embattled outline – mostly sharp and irregular, sometimes almost round – suggesting a potential extension of the image beyond the limits. 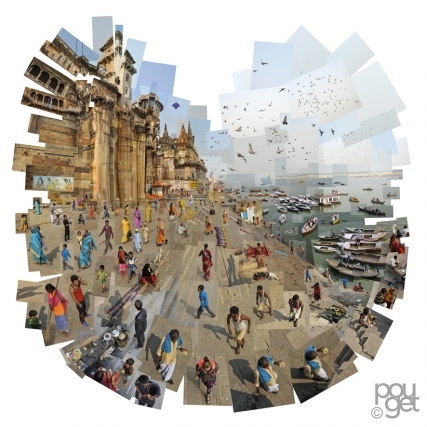 By merging multiple photographs into a single image, Pouget plays with time: on the one hand, he compresses it, encapsulating an ideal moment; on the other hand, he dilates time, offering to the viewer the opportunity to choose any desired moment, corresponding to a given fragment of the great “puzzle”. Space and time are inextricably linked. The overall pictures seem to form a coherent whole. 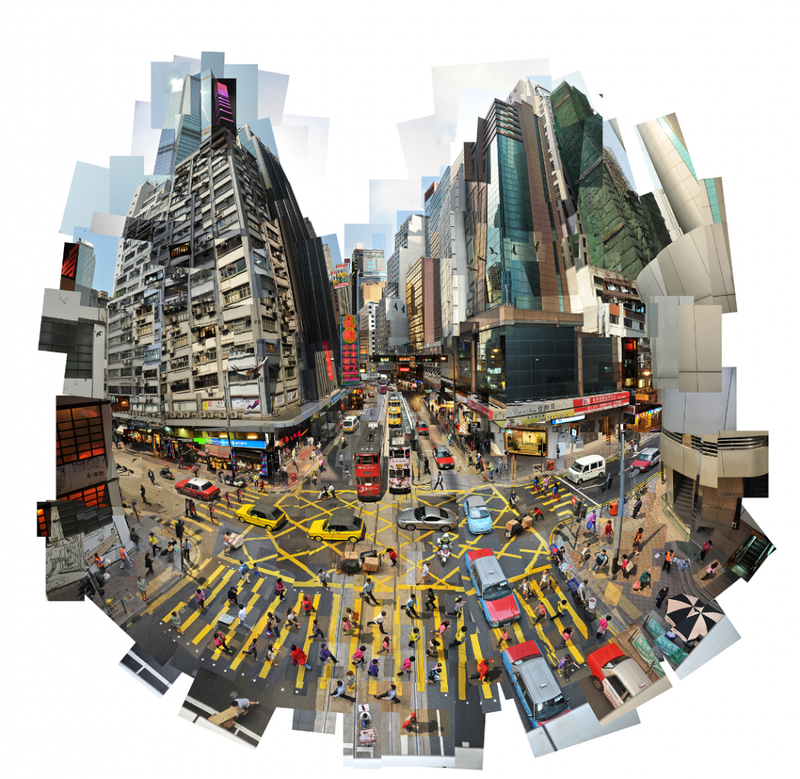 The viewer could identify iconic elements of known spaces. This apparent familiarity is contradicted by small details, noticed at a second glance, which defy the normal logic. The universe created by Pouget is, in fact, an imaginary world, reinvented with tenderness, sometimes with sense of humor and (self-) irony. One can recognize New York by landmarks like Penn Station or Empire Street. Other works have subjects like a kissing couple at Place de la Concorde in Paris, fishermen’s boats in the French city of Sète, sunny beaches in Rio or panoramic cityscapes seen from a window; an interior with a cat – Saint-Valentin, a magic circus show – Sous les étoiles, or a garden with roe deer – Ma biche et moi. Each image has something surreal, both disturbing and exciting the viewer. In The Corner, for example, the traffic light is red and green at the same time. The photographic assemblages created by Pouget allude to the fragmentary culture of contemporary society. In our era of speed and multi-tasking, we surf TV channels and the Internet or we read only a few paragraphs from a newspaper. In a visual and metaphorical way, the artist gives us back the lost fragments of our memory. If we leave traces of our passage in different places, these places also leave “footprints” in our minds, as time goes by.